Prepare for BLAST OFF! Rocket across the waves in an action-packed race to have the most fun. 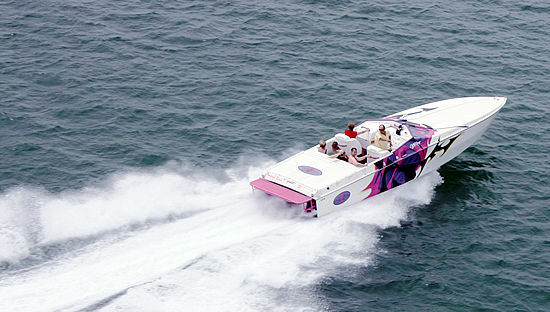 Two, four and six hour power boat racing adventures available. Learn the basics of high-performance boating in this incredible offshore adventure. Your adventure begins dockside at the Miami Beach Marina. There, youll meet your captain and go over your pre-cruising vessel checklist. After a safety briefing and orientation, you’ll begin your lessons at sea. In the Intracoastal Waterway, youll learn the rules of the road, speed zones and docking procedures. Then, its into the Atlantic where youll practice planing up to speed, maneuvering through zones, wave jumping, throttling, course maneuvering, starting and stopping. This full day adventure typically begins and ends at the Miami Beach Marina. Lunch at a tiki bar and refreshments aboard the boat are included in our standard full-day offshore adventure. More info.